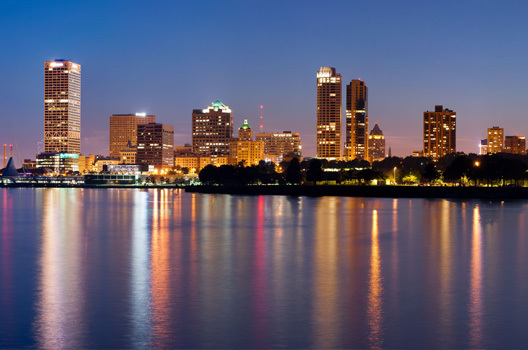 Milwaukee, Wisconsin, with a population of 600,000 and a metropolitan community of 1.4 million, is the largest city in the State of Wisconsin and the 31st most populous city in the United States. Nestled along a magnificent bluff overlooking Lake Michigan, the scenic downtown is home to botanical gardens, a world-class symphony orchestra, museums, a ballet company, a theater district, the Milwaukee Bucks, the Milwaukee Brewers, and many fine restaurants. The Lake and its harbors are skirted by scenic parklands and provide first class opportunities for boating enthusiast. Milwaukee County is also known for its “Grand Necklace of Parks” totaling more than 140, which offers picnic facilities, cross country skiing and ice skating. The first Europeans to pass through the area were French Catholic missionaries and fur traders. In 1818, the French-Canadian explorer Solomon Juneau settled in the area, and in 1846 Juneau’s town combined with two neighboring towns to incorporate as the City of Milwaukee. During the 1840’s and the following decades, large numbers of Germans immigrated to the city and started the beer industry. By 1856, there were more than two-dozen breweries in Milwaukee. Milwaukee is home to the international headquarters of six Fortune 500 companies. Service and managerial jobs are the fastest-growing segments of the Milwaukee economy, and health care makes up 27% of the jobs in the city. A recent study ranked Milwaukee as the 15th most walkable of the fifty largest US cities. Milwaukee has one of the highest per capita student populations in North America, ranking 6th among US and Canadian cities in number of college student per 100 residents.